← Borders and B & N and Amazon and Costco and … Oh, My! Dad appears carrying toddler who has apparently experienced our kids’ section before. He hardly seems the age to remember store layout, but the instant his feet touch the floor he becomes a heat-seeking missile. His chubby little legs churn down the aisle and he crows in thrilled anticipation: Car! Car! Car! 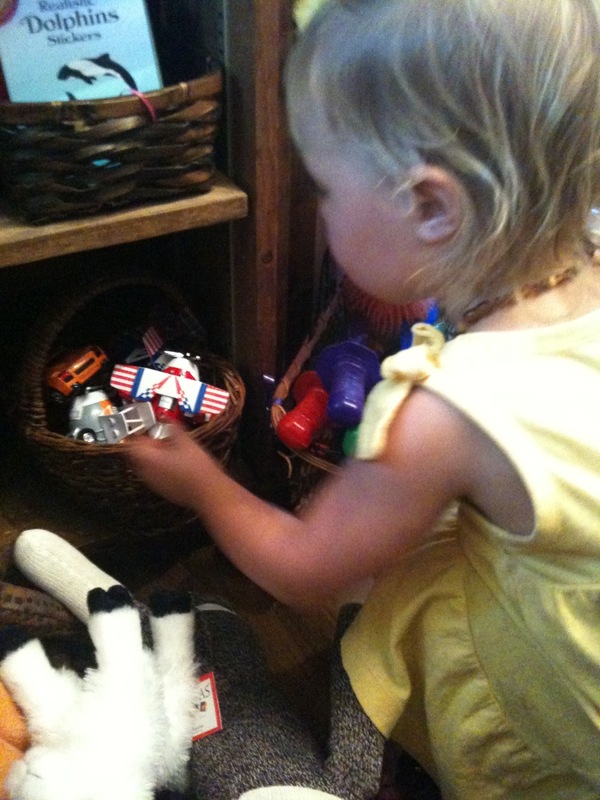 Rounding the corner, he throws himself upon the little basket full of miniature vehicles. Catching up with him, Dad looks down upon auto mayhem and says reflexively “One at a time!” Too late for that. Big Little board book faced out on the shelf catches his eye: “Look at the books!” he says. “A car!” shouts his son, spinning wheels with the abandon of a DJ at a rave: yellow taxicabs, school buses, police cars, surf woodies, a boxy Element, silver sports cars, VW beetles in tumbling trajectories. Watching similar scenes day after day, one can’t help tipping toward the goofy idea that cars have somehow gotten encoded in male DNA. I know that sort of thing is supposed to take thousands of years to mutate into the genome, but maybe car years have their own accelerated universe, like dog years? It puzzles me because in my day, cars were made of metal, could be souped-up by any male old enough to hold tools, and almost every teen boy had some illicit experience of either drag-racing or road racing. Now, however, car tinkering is almost off-limits to all but NASA-equipped technicians. Bereft of the opportunity to caress and modify their own muscle machines, boys seem to have abandoned road-racing for the internal combustion of computer graphics and app code. Do you think the car-testosterone link is already under quiet internal pressure to shift to glowing LCDs? Nonetheless, little boys still love cars. In any case, back here in the bookstore, parents float weird logic in hopes of getting their little ones to step away from the vehicles without tearful outbursts. Like “They only sell ONE truck per child.” and “If we come back tomorrow, we’re not getting another car. This is the ONLY one. You understand? 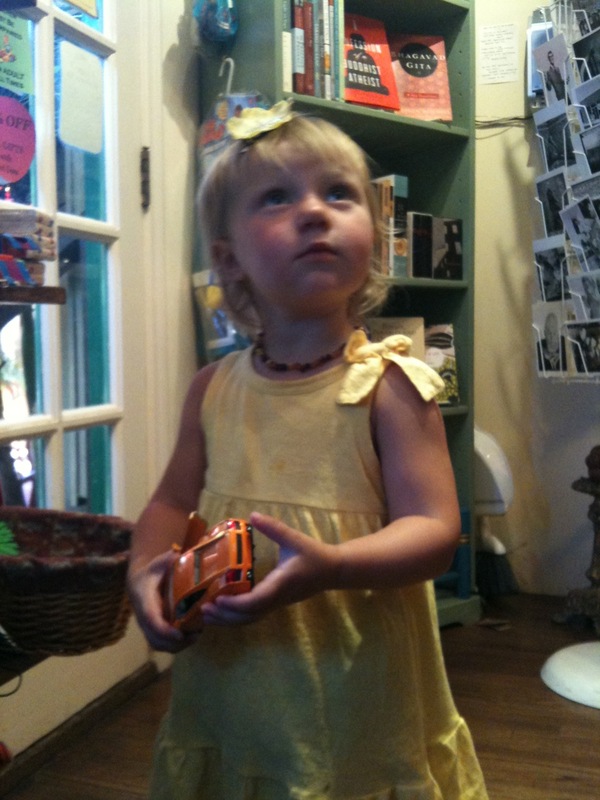 OK?” As for my goofy theory about cars and male DNA, just moments ago an enchanting little girl with a flower hair ornament matching her yellow summer frock came in from the garden with her grandmother. 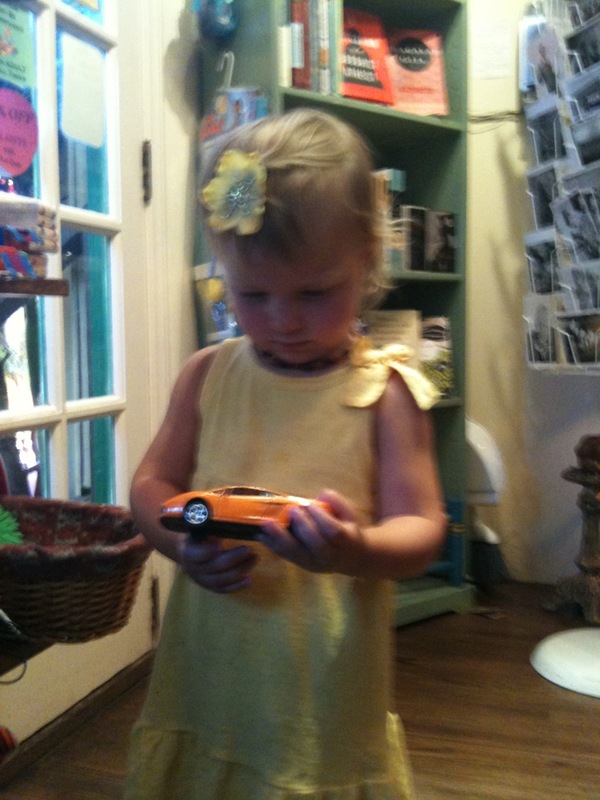 Turning into the kids’ section, she made a direct beeline for the basket of cars and rapturously seized upon an orange Lamborghini. You go, girl! The little girl is so cute! Go figure. I was with you and your goofy theory. Little blondie is a secret cross dresser.